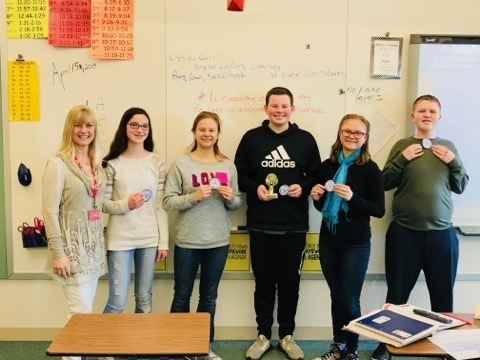 Students from Mrs. Wren's 8th Grade Honors Algebra class were among the nearly 160,000 students worldwide to participate this year in the Math Olympiad Program! All students who participated received certificates today, with the top four being awarded patches and first place being awarded a patch and trophy. Jack Mills received first place, Abby Henson received second place, Graciela and Sophia Best tied for 3rd, and Kieran Steward received 5th. All students participated in a series of five monthly contests of 5 problems each. Mrs. Wren taught her students to solve unusual and difficult problems with weekly practice sessions. Since 1979, Math Olympiads has provided challenging, thought-provoking problems that stretch the abilities of students in grades 4-8, strengthening their foundation for both assessment tests and more advanced studies. Congrats to these students! !